Allmax Ultra-High Grade BetaSynth Beta-Alanine was built for the ultimate in performance. Research has shown Beta-Alanine increases muscle Carnosine levels that may lead to increases in Nitric Oxide (NO) production and reduced muscular acidification during intense training. 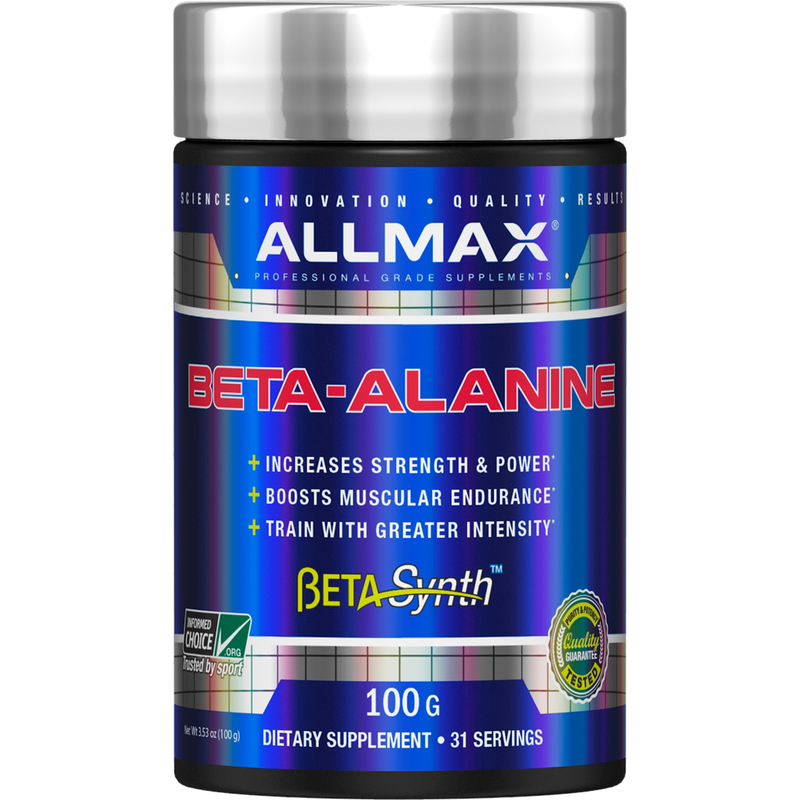 Simply stated, Allmax BetaSynth Beta-Alanine delays muscular fatigue allowing you to increase your performance output. Greater intensity and exertion in the gym or on the field result in increased signals to tell your body to build muscle. Beta-Alanine does not need to be taken pre-workout. Beta-Alanine exerts its effects by building increased Carnosine in your muscle. Smaller more frequent dosages have been found to be the most effective. BetaSynth Beta-Alanine is a premium source of Beta-Alanine that has been laboratory tested and certified over 99% pure. Take half a Tsp. (1.6 g) to 1 Tsp. (3.2 g) 2 to 4 times daily dissolved in juice, water or your favorite supplement. Do not add to products already containing Beta-Alanine. Beta-Alanine can create excess sensory effects at the skin level in some users. 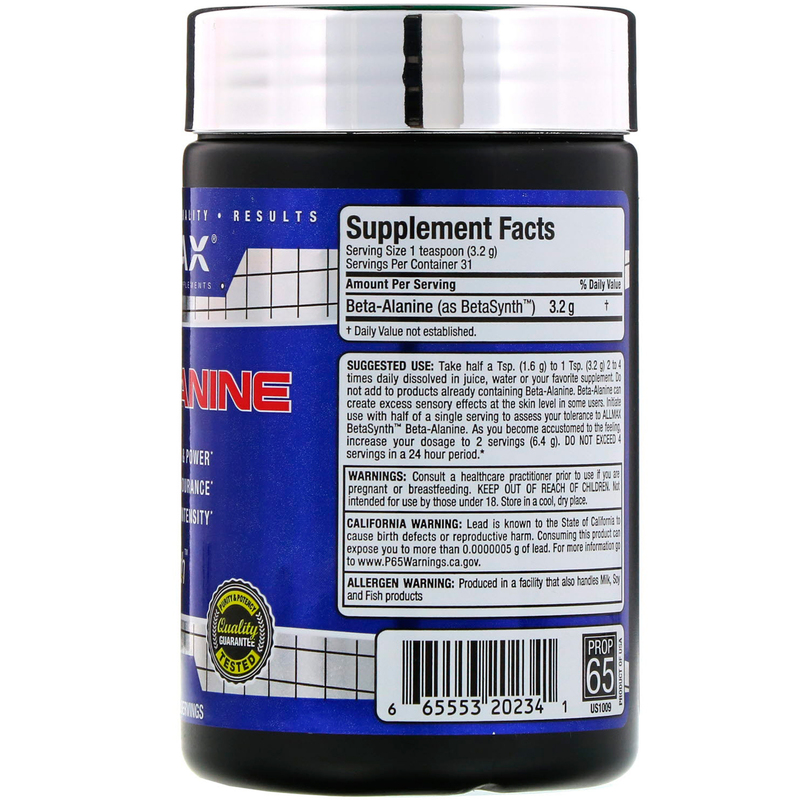 Initiate use with half of a single serving to assess your tolerance to Allmax BetaSynth Beta-Alanine. As you become accustomed to the feeling, increase your dosage to 2 servings (6.4 g) Do not exceed 4 servings in a 24 hour period. Allergen warnings: Produced in a facility that also handles milk, soy, and fish products. Consult a healthcare practitioner prior to use if you are pregnant or breastfeeding. Keep out of reach of children. Not intended for use by those under 18. Store in a cool, dry place. California warning: Lead is known to the State of California to cause birth defects or reproductive harm. Consuming this product can expose you to more than 0.0000005 g of lead.